Bulletin 1792 ArmorBlock MaXum I/O offers greater flexibility in severe environments. 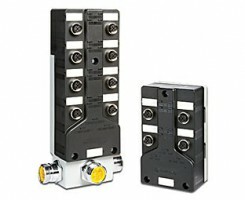 This compact, low-profile I/O is rated IP67 and NEMA 4X for on‑machine use. I/O blocks include built-in DeviceNet network support and leverage the DeviceNet KwikLink flat media system to save space and reduce installation costs. Integrated DeviceLogix Smart Component Technology provides simple, local control functions.